Low profile hinges provide maximum strength between sections. Adding stability when compared with ordinary, vertical hinges. Tamper-resistant safety bottom brackets help avoid possible injury by preventing inadvertent loosening when the counterbalance cables are under tension. If you live in an area subject to heavy winds, you should consider wind resistant garage door reinforcements. In some areas, windload doors may be required by local building codes. Quick Install design with factory installed hardware and tracking system. Total Pack collects everything needed for installation into an "all in one trip" bundle. Patented design pushes fingers away from closing door. Industry’s first integral pinch-resistant panel design. After you’ve chosen the correct size, apply the decorative styles to your garage door. The engineered polymer trim pieces are finished in matching Eurowhite or may be painted. If you have selected a windowed top panel, you can select decorative window overlays. They simply adhere in place using a permanent adhesive. Carriage house doors are factory primed and painted. Leave them Eurowhte or pick a color to match or compliment your home’s trim. Va Door recommends that styles be painted with a light color latex exterior paint. 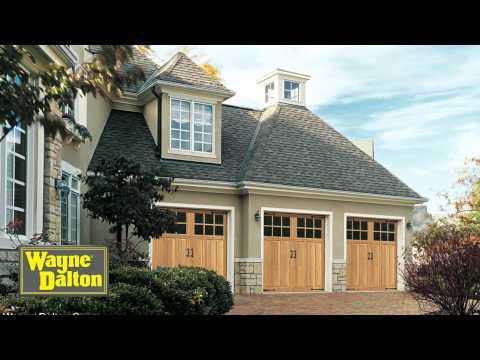 Carriage house doors are engineered with three panel sections vs. the four panel designs of other models. This design minimizes visual breaks and helps eliminate the "postage stamp" look of other doors. Field-applied styles create a deeper, sharper definition and more authentic look than can be achieved by stamped metal doors. Quick Install design with factory installed hardware and tracking system.